The New PM of Jamaica is promising wealth, jobs, healthcare and a land of plenty.. much like any other politician. I think "our Harry" will do well on his visit. Harry will visit Belize, the Bahamas and Jamaica on behalf of The Queen as part of the Diamond Jubilee celebrations from March 2 to 8. Harry will be in Belize (including Belize and Cayo Districts) March 2 and 3; Bahamas (New Providence Island) March 3-5. Prince Harry will be in Jamaica (including Kingston and Falmouth) from March 5 to 8, the palace says. I'm sure our boy will do just fine! He's going to charm the socks off Ms Simpson Miller! He is known as the party prince, but Prince Harry will need to show tact, maturity and diplomacy when he arrives in the Caribbean today for his first solo Royal tour. One of the key engagements being undertaken by the 27-year-old will be a meeting with Jamaica’s Prime Minister, Portia Simpson Miller, who said in January that she intended to remove the Queen as head of state to turn the country into a republic. The UK Press will never give Harry the credit he deserves. He was loved by the US when he trained there a few months ago and he has been on trips for his charity to both Africa and the Caribbean before, so why is the press implying Pr.Harry has never been out of the Palace before? A source at St James’s Palace said aides would be keeping “a wary eye on developments” over the coming days, but were not expecting any problems. Oh, really? Was this aid Pinkerton? "William, stop worrying...the paps wouldn't dare!" His private secretary boasted Prince Harry would bring his 'own brand of enthusiasm' to his Diamond Jubilee tour of Central America and the Caribbean. And the fun-loving royal certainly proved him right, as he had a ball knocking back drinks and dancing with the locals in Belize tonight. It was the first day of his week-long tour of Commonwealth countries in the region, which is also his first solo overseas trip representing his grandmother, and he approached the situation with gusto. That is an unfortunate and unattractive first pic and they tried real hard to push the partier image, but, in the end all this looks like is plain good fun, to me. He knows how to relax and be himself and it's absolutely undeniably charming. Yooper, I agree with them trying to push the "party boy" image by posting those pics of him taking a drink-which, for all we know were mere sips throughout the night. 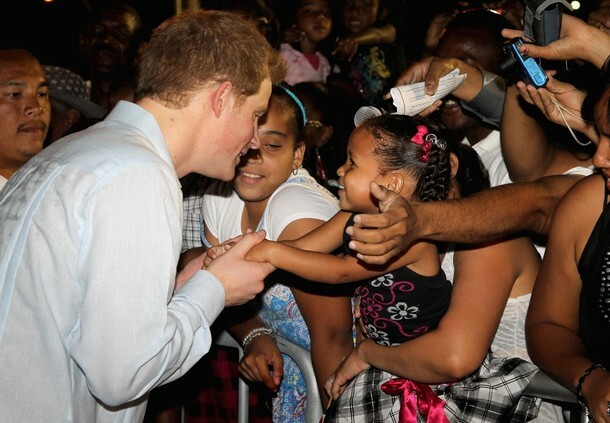 Prince Harry: Belize for the Queen's Diamond Jubilee Tour!